What is SOINN? 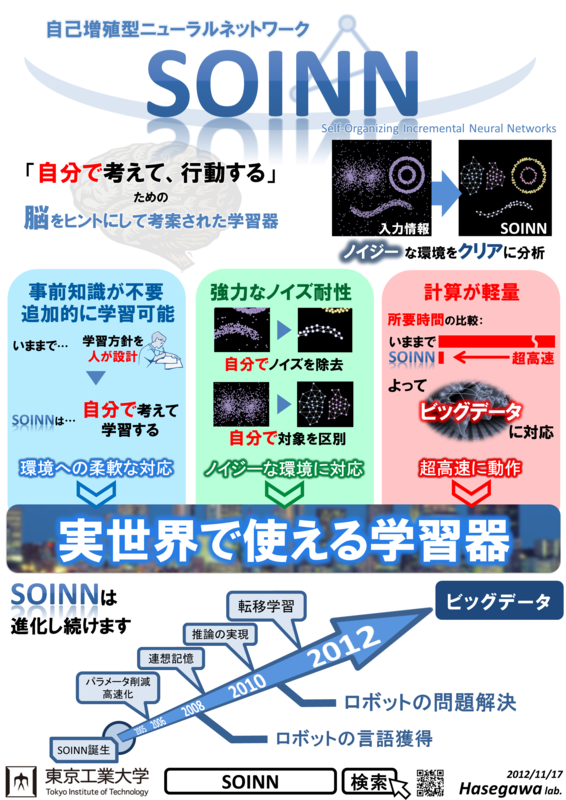 The SOINN is an unsupervised online-learning method, which is capable of incremental learning, based on Growing Neural Gas (GNG) and Self-Organizing Map (SOM). For online data that is non-stationary and has a complex distribution, it can approximate the distribution of input data and estimate appropriate the number of classes by forming a network in a self-organizing way. In addition, it has the following features: unnecessity to predefine its network structure and high robustness to noise. 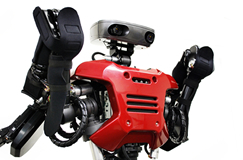 Thus, we consider the SOINN to be a very efficient method for real-world applications. This paper presents an on-line unsupervised learning mechanism for unlabeled data that are polluted by noise. Using a similarity thresholdbased and a local error-based insertion criterion, the system is able to grow incrementally and to accommodate input patterns of on-line nonstationary data distribution. A definition of a utility parameter, the error-radius, allows this system to learn the number of nodes needed to solve a task. The use of a new technique for removing nodes in low probability density regions can separate clusters with low-density overlaps and dynamically eliminate noise in the input data. The design of two-layer neural network enables this system to represent the topological structure of unsupervised on-line data, report the reasonable number of clusters, and give typical prototype patterns of every cluster without prior conditions such as a suitable number of nodes or a good initial codebook. An enhanced self-organizing incremental neural network (ESOINN) is proposed to accomplish online unsupervised learning tasks. It improves the self-organizing incremental neural network (SOINN) [Shen, F., Hasegawa, O. (2006a). An incremental network for on-line unsupervised classification and topology learning. Neural Networks, 19, 90–106] in the following respects: (1) it adopts a single-layer network to take the place of the two-layer network structure of SOINN; (2) it separates clusters with high-density overlap; (3) it uses fewer parameters than SOINN; and (4) it is more stable than SOINN. The experiments for both the artificial dataset and the real-world dataset also show that ESOINN works better than SOINN. A fast prototype-based nearest neighbor classifier is introduced. The proposed Adjusted SOINN Classifier (ASC) is based on SOINN (self-organizing incremental neural network), it automatically learns the number of prototypes needed to determine the decision boundary, and learns new information without destroying old learned information. It is robust to noisy training data, and it realizes very fast classification. In the experiment, we use some artificial datasets and real-world datasets to illustrate ASC. We also compare ASC with other prototype-based classifiers with regard to its classification error, compression ratio, and speed up ratio. The results show that ASC has the best performance and it is a very efficient classifier. An incremental online semi-supervised active learning algorithm, which is based on a self-organizing incremental neural network (SOINN), is proposed. This paper describes improvement of the two-layer SOINN to a single-layer SOINN to represent the topological structure of input data and to separate the generated nodes into different groups and subclusters. We then actively label some teacher nodes and use such teacher nodes to label all unlabeled nodes. The proposed method can learn from both labeled and unlabeled samples. It can query the labels of some important samples rather than selecting the labeled samples randomly. It requires neither prior knowledge, such as the number of nodes, nor the number of classes. It can automatically learn the number of nodes and teacher vectors required for a current task. Moreover, it can realize online incremental learning. Experiments using artificial data and real-world data show that the proposed method performs effectively and efficiently.